The Youngest Bride by Menucha Chana Levin. I met Menucha on-line through a mutual acquaintance a few months ago. 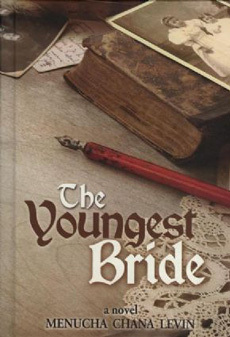 When she mentioned she had written a novel The Youngest Bride (Israel Book Shop Publishers) and was willing to send me a copy, I jumped at the chance. As I started to read it, I was instantly immersed in the vanished world of mid 19th century Lithuania. My paternal great-grandparents hailed from Vilna. Reading The Youngest Bride was like traveling back in time and seeing what my relatives’ lives might have been like. This added yet another dimension to my enjoyment of this heart-warming, coming-of-age novel and its spunky young heroine, Raizel. Menucha agreed to answer some questions about herself, her book, and the inspiration for it. PJV: Tell us a little about yourself, Menucha. I was born in South Africa but grew up in small towns in Canada where my father zt'l was a rabbi. I married a New Yorker; we lived in Toronto for many years and our four children were born there. We made aliyah with our family in 1991. Though writing since the age of six, I started getting published only after attending a women's writing group in Jerusalem. Living here inspires my writing. My work has appeared in Horizons, the Jewish Observer and in anthologies People Like Us and Heartbeats. The Youngest Bride , my first published novel, came out in December, 2008. PJV: Where did the unusual story line come from? The Youngest Bride is a novel based on facts from my own family history. I grew up hearing the story of my great-great-grandmother who was married as a little girl to a boy not much older than herself, in order to save him from the Russian army, as married men and boys were exempt from becoming Cantonist soldiers. According to family legend, my little ancestor fell asleep in her father's arms under the chuppah, thus missing her entire wedding. The next day when a little cap was put on her head since she was now married, she took it off and made mud-pies in it! In one version of the story, my little ancestor was only five years old at the time of her wedding. In another version, she was eight. For the purposes of my novel, I changed her age to twelve. But the ‘five-year-old’ version was too endearing to discard altogether so I included it as the story of another little girl. I was always fascinated by the story and wondered what was it like for my ancestor to grow up knowing that she was already married. Did she regret not having a real wedding celebration? How did she and her young husband feel towards each other when she turned eighteen and they began their actual married life together? Unfortunately, family history did not include those crucial details so I had to conjecture them myself. One evening, while waiting for a delayed bus, the story suddenly came to me, insisting on being written. By the time I reached home about an hour later, the basic plot and characters had been worked out in my mind. Other family stories, some true, others adapted, were included as well. Finally, after many years of trying to find the right shidduch (i.e. publisher) for The Youngest Bride, Israel Book Shop Publishers of Lakewood, N.J. turned out to be the destined one. PJV: I understand that this is your first book. Isn't it a bit unusual for a grandmother to jump into writing at the stage of life when women generally start to slow down and concentrate more on family and home? I actually wrote The Youngest Bride nine years ago, though it just got published now. And I really have more time to write now than when my kids were younger. PJV: What does your family think about your literary side? And what do they think of your book? My family has always been very supportive of my writing. My then 12 year old daughter Shani kept encouraging me. Every night, I would read her what I'd written on the computer. Her feedback and suggestions were wonderful. I might not have finished the novel if not for her ongoing support. The whole family was impressed and excited when the book came out. One of the highlights was receiving a huge vase of flowers and a lovely note of congratulations from them. PJV: The book includes neither a glossary nor translations of Yiddish terms. Tell me how that came about. Didn’t that decision limit your potential readership? That was the decision of my editor. But even people unfamiliar with Yiddish can relate to the book. One of my friends who is French-Sephardi and does not know a word of Yiddish, enjoyed it very much. She even bought another copy for her daughter-in-law in Israel. PJV: Your book is filled with authentic-sounding details. How did you research the period? I read books about the 19th century shtetl and did research online about life in Lithuania during that period. It's amazing how much information is out there. In one Jewish genealogy site, I found the names of all the families in my ancestors' village of Ponedel in 1847. PJV: Possible conscription into the Russian army plays a key role in this story. This threat was taken very seriously by the Jewish population. Why? Being conscripted into the Russian army for twenty-five years was a terrible, life-threatening experience which many young boys did not survive. Many were horribly tortured and forced to accept Christianity. PJV: I thought that this threat was directed just at Jews. Who else was at risk? Lithuanians, who were Roman Catholics, were also conscripted and many forced to convert to Russian Orthodoxy. PJV: A character in The Youngest Bride returns after being kidnapped and forcibly conscripted as a young boy. Have you actually heard of Jews who survived the army's brutality and brainwashing after many years and made their way home? Yes, there are many stories of those who returned. Some, who were men in their late 30s or 40s by then, had only dim memories of being Jewish. But others did find their way home, clinging to the treasured remains of their tattered tzitzit (ritual fringed garments). PJV: Was it challenging to incorporate Yiddish expressions smoothly into your book? English is literally my mother tongue but my father spoke Yiddish. I grew up hearing it and can still understand a bit but unfortunately do not speak it. But I think it is a wonderful, expressive language, especially when it comes to describing types of people: shlemiel, klutz, berrier, etc. So it was not at all difficult to incorporate the Yiddish expressions. In fact, I would have liked to include even more! I imagine in Israel your book is one of many of the same genre. In the rest of the English-speaking world, it's more unusual. What kind of reaction has your book generated so far? It's been very well-received for a novel by a first-time author. My daughter-in-law sent me a photo of it displayed in Eichler's Book Store window in New York. It is also available from the publisher and on Amazon. I have just completed another novel. This one is also historical but very different from The Youngest Bride. It's been very well-received for a novel by a first-time author. My daughter-in-law sent me a photo of it displayed in Eichler's Book Store window in New York. It is also available from the publisher and on Amazon. How difficult is it to write a book? It's definitely more complicated than writing an article or short story. It takes far more time and effort and it's not easy living with all these characters in one's head! But when it's all done at last and you are holding your own finished book in your hands, I must admit that is a real thrill. PJV: Thank you for speaking with me, Menucha. Wishing you continued success with your novel and good luck with your next book. I’m looking forward to reading it. Joan Brunwasser lives in Skokie, Illinois. She is a writer and editor for OpEdNews, and office manager for Maxwell St. Klezmer Band.